Dozens of Malawians have opted to be repatriated following attacks on foreigners last week in Durban, officials from Malawi and South Africa said Tuesday. Some 300 Malawians were displaced following the spate of deadly violence, which prompted condemnation by South Africa's government and raised fears of a resurgence of xenophobic bloodshed. Around a third of those driven from their homes have opted to leave the country, the officials said. "At the moment 105 (have) requested voluntary repatriation -- only 85 presented for interviews and processing," Malcolm Canham, the senior coordinator for disaster management in Durban told AFP. The UN International Organisation for Migration (IOM), the Malawi embassy and South African immigration officials were processing the applicants, he said. South African President Cyril Ramaphosa on Monday had "condemned violence against foreign nationals" and called on police to identify those responsible and bring them to justice. The assaults prompted emergency talks between Foreign Minister Lindiwe Sisulu and Police Minister Bheki Cele, and diplomats of African countries. Three South Africans were killed during the unrest in the southeastern KwaZulu-Natal province last week when protests targetting foreign-owned shops spilled into violence. Police said the owner of one shop attacked by a mob opened fire, killing two of them. A third person, a woman, died after she fell off a roof while fleeing protesters. A representative of the displaced group, Wrightwell Saka, told AFP many of those wanting to return to Malawi were too scared to stay. "The situation was bad... they attacked us during the night, it was midnight, we (were not) ready for anything," said Saka. "Luckily most of us escaped, we escaped unhurt" but they had "never experienced something like this. That's why they have chosen to be repatriated back to Malawi." 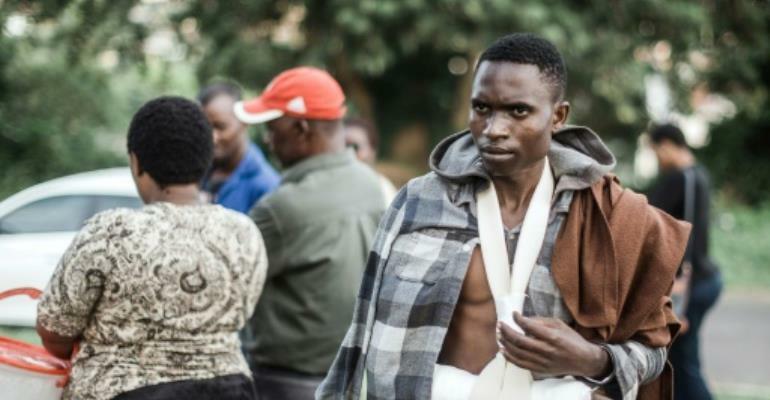 Another Malawian, Alfred Chirwa, said his compatriots were attacked because "they say we are coming here to steal their jobs," adding some South Africans had threatened further assaults. Such attacks have become increasingly common in recent years in South Africa, the most developed sub-Saharan economy, as immigrants bear the brunt of anger resulting from chronic unemployment and limited progress made by many poor black people since white-minority rule ended in 1994. The country hosts millions of foreigners, most from African countries and many of them undocumented. Malawi's Information Minister Henry Mussa said his government was doing everything "possible to secure the safety and welfare" of its citizens.